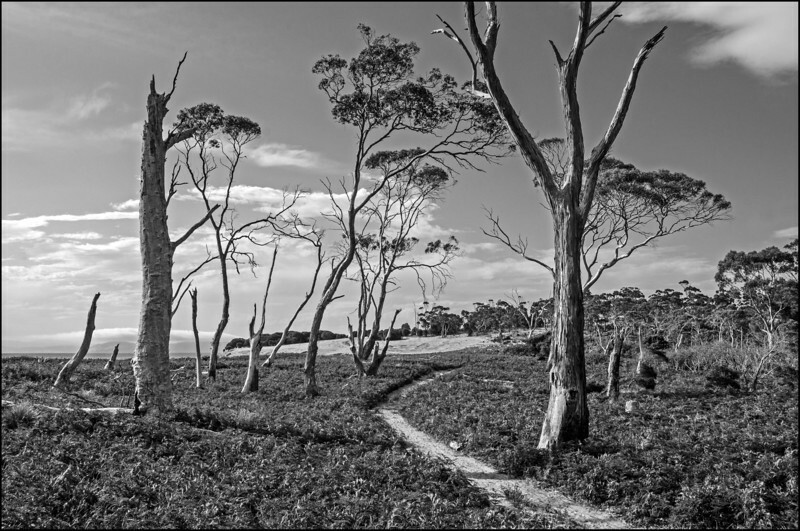 As explained in a little bit more detail in the Bishop and Clerk hike that I recently published, getting to Maria Island requires either booking a charter flight, paddling a kayak across the Mercury Passage, or as most ‘normal’ people will do, taking the ferry from Triabunna. 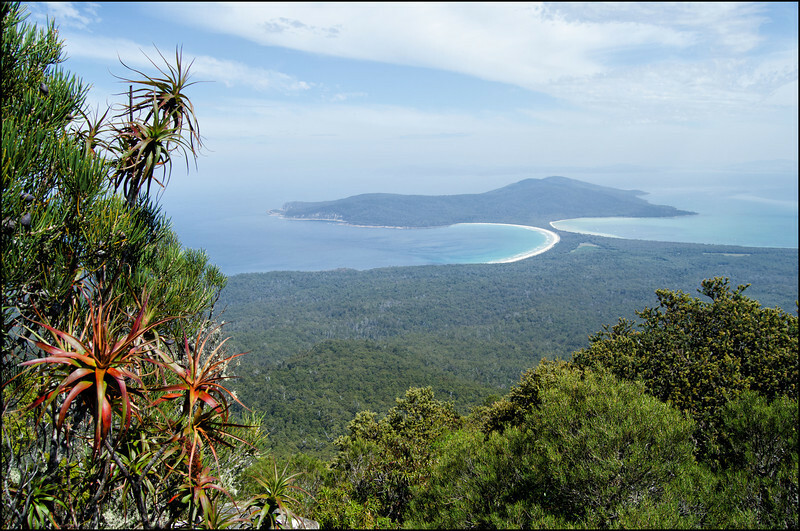 For more information on getting to Maria Island, camping options available to you, and other attractions on the island, click here. 1. 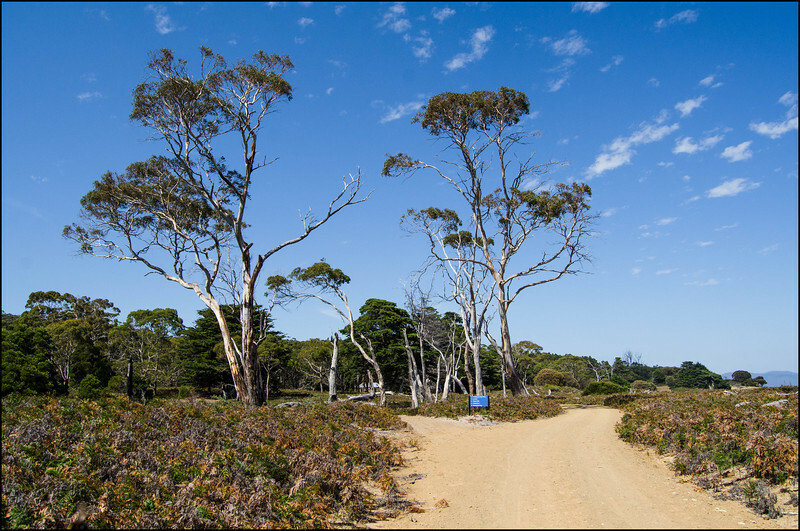 Starting at Darlington, follow the dirt road south towards Hopground Beach and the famous Painted Cliffs. Those that have plenty of time up their sleeve may be quite happy with walking this section, but we were keen to mix it up a bit and tackled this on mountain bikes (hired from the ferry company, but you can also hire them from the Ranger’s office on the island). As discussed shortly, you can’t take your bikes all the way to the top of Mt Maria, but you can save yourself an hour or so of walking along the way. 2. After crossing the lagoon at the northern tip of Hopground Beach you’ll come to a fork in the road, with the trail to the left being the one you’ll want follow (the trail to the right will take you to the Painted Cliffs only another 100m further on and well worth a visit if you have a spare 30 minutes). This section starts out quite sandy, so be careful not to hit this at speed on your bike, as you are likely to jack-knife and come a cropper! A fork in the road…take the trail to the left. 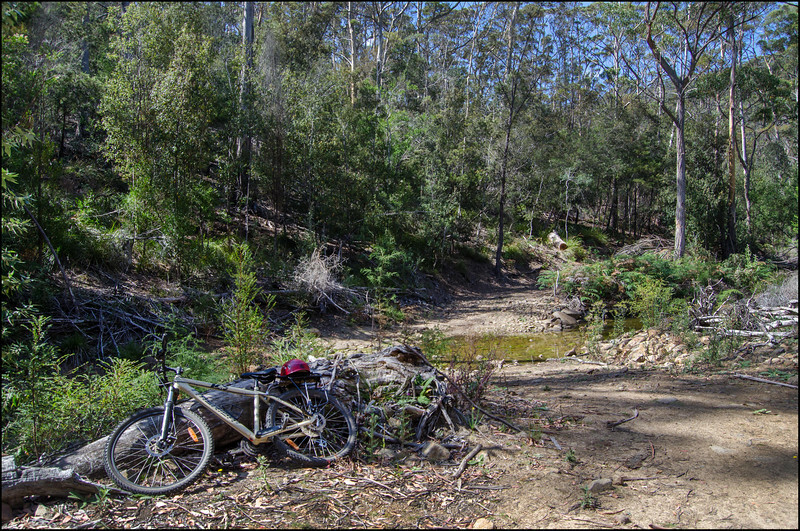 Over the next 15-20mins (by bike) the track gradually becomes rougher, alternating between gravel, sand and rock as it parallels the creek to your left. Despite this, the gradient is not steep. 3. There are a couple of creek crossings that you will need to navigate. We were there towards the tail end of summer and found there to be very little water, and hence crossing with our bikes was not an issue. However, I can imagine after rains that this may be of more concern. Beyond the creek crossings the track starts to ascend, but at a manageable rate. Neither of us do much cycling and we still found it quite easy to maintain a steady pace. 4. 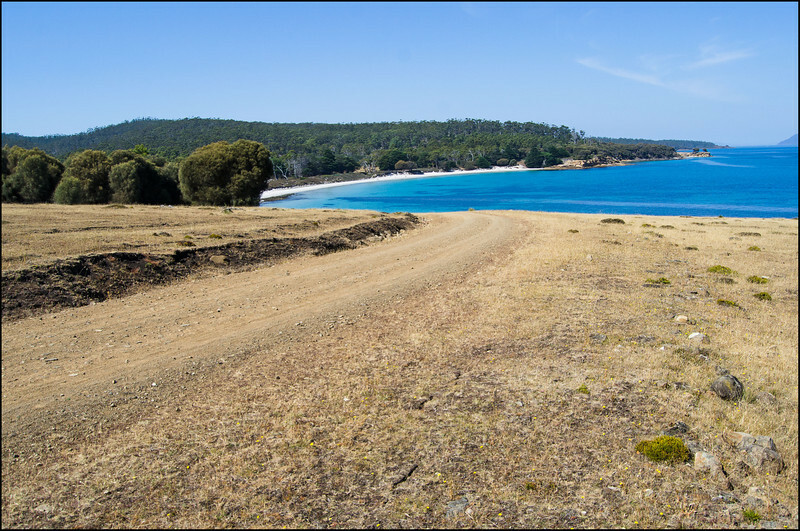 Approximately 35-40 minutes after first leaving Darlington, we found ourselves at a signed junction in the tack, with the trail to the left taking you to Mt Maria, and the trail to the right continuing inland until it eventually rejoins the coastal track. As you can see in the photo, if you decline the bike option it will take around 1hr 15mins to walk from Darlington to this point. Another fork in the road…again, take the trail to the left. 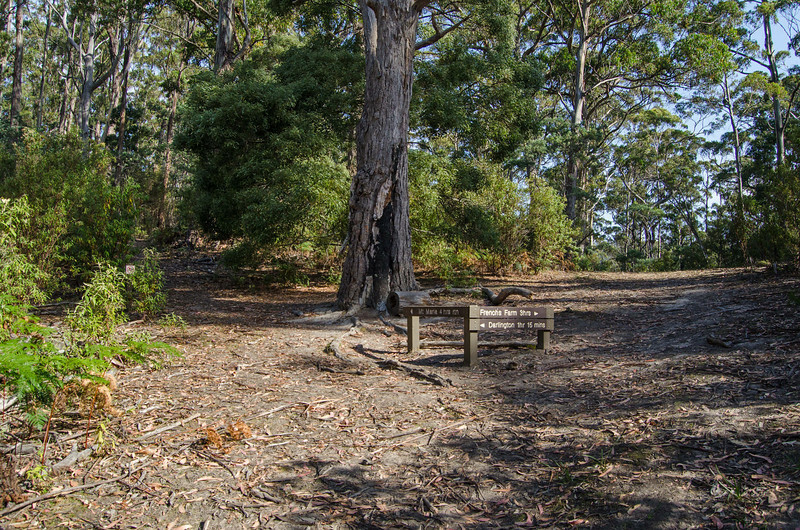 This was a great place to take a seat under the grand old gum tree, have a cool drink and catch our breath before commencing the bushwalk proper. Leaving our bikes and helmets by the side of the track (don’t worry about theft, no one is going to bother on this island! ), we took our first steps up the Mt Maria track. Initially, the path is quite broad, allowing two to walk abreast with ease. The surrounding forest is fairly open and if you’re lucky you may spot the odd kangaroos or echidna. If you’re unlucky (as I was) you’ll stumble past the odd tiger snake! 5. 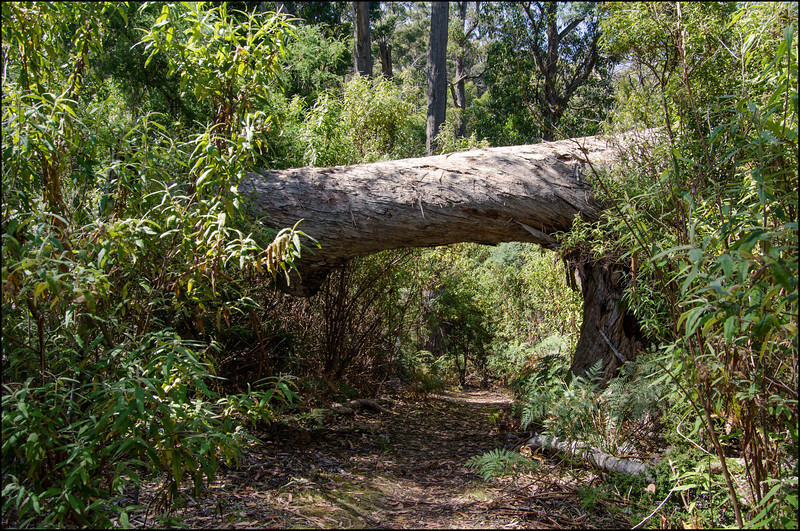 About 10-15 minutes into the walk we found ourselves passing underneath a gorgeous natural archway formed by a massive tree that had fallen across the track some time earlier. Quite spectacular! As you progress further, you’ll notice the path beginning to narrow and the vegetation becoming more dense on either side. To be honest, there isn’t a whole lot to see along this section of the hike, but them’s the breaks! From the junction, this section of the trail will probably take you between 1-1.5hrs. The trail does become steeper towards the end, and you may also notice the increasing presence of small rocks on, and by, the path. A sign of things to come! 6. We’d heard that there was a bit of a rock scramble at the end of this hike, but that would have to be one of the biggest understatements of the century! While I don’t find this sort of terrain too taxing (long legs and all that), Karen does tend to find these boulder fields a lot more difficult. They may look quite small in the photo above, but in reality many of those rocks were absolutely massive, often requiring us to try a number of alternative paths in order to progress up the slope. Full credit to her though, she put her head down and bum up (quite literally at times!) and after perhaps 45 minutes we found ourselves diving back into the forest at the top. Bishop and Clerk is over the other side of that peak (Mt Pedder) to the north, but unfortunately there is no trail linking it to Mt Maria. Congratulating ourselves on having finished the rock scrambling component of the hike, we emerged from the forest only to find ourselves faced with another 10-15mins worth of some very extreme (for us anyway!) rock climbing and manipulation of legs and arms into positions we never dreamed possible. If we thought the rocks below were big, these were giants in comparison and we had to find our way up and over them in order to reach the summit that was so tantalisingly close! Again, it took a few false starts on occasion, but with jelly legs and flailing forearms we did prevail! 7. We did it! 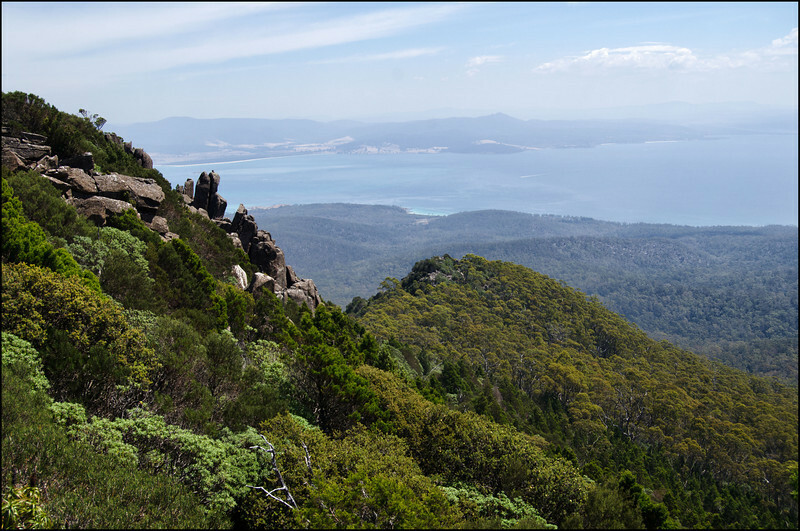 Three hours after leaving Darlington we had ascended 709m to be greeted by blue skies and simply sensational views across to the Tasman Peninsula in the south, Marion Bay to the south west and Freycinet to the north. The view from the summit of Mt Maria! I thought the views from Bishop and Clerk were good, but these were even better. How good do those curves in the sandy isthmus look?! We were so hot and sweaty we would have given anything to be down there dunking our heads in the cool waters! Unfortunately, there is a rather sombre aspect to this hike that can’t go unmentioned. It was while having a bite to eat that I realised that I had missed a phone call from the dog kennel earlier in the day. On calling back we received the devastating news that Abby, our loyal companion for the past 12 years had passed away overnight. And so it was with mixed emotions that we commenced our descent back to Darlington. Predominantly in silence, occasionally reminiscing over the good times and the many adventures we had shared together. At times the boundary between sweat and tears was blurred. Arriving back at our tent in Darlington we continued our reverie over a couple of glasses of red wine, in remembrance of better days. 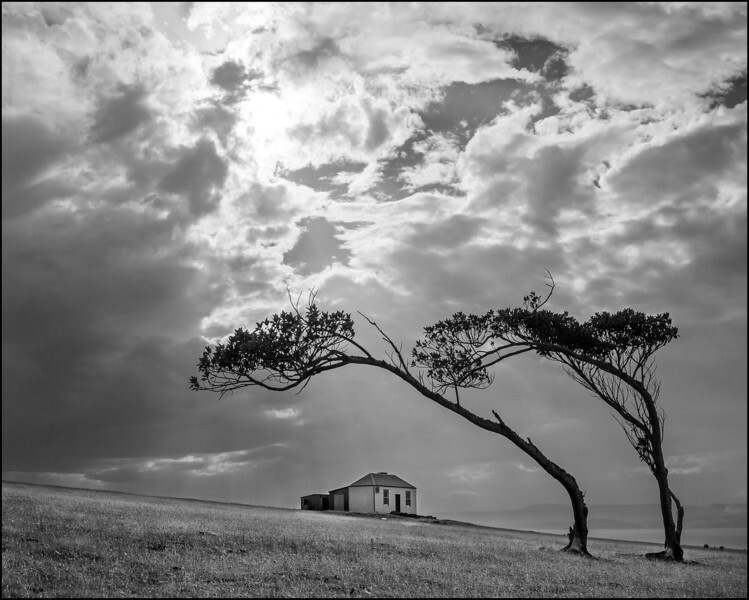 Along the way I did manage to grab a couple of quite striking monochromatic images. Looking back I suspect my lingering mood had some influence over their composition. This walk isn’t easy. Getting to the foot of the scree slope may be enough for many, yet the reward for making that final effort is well worth it in my opinion. In total it took us around 7 hours, of which perhaps an hour or so was spent taking photos and stopping for breaks. 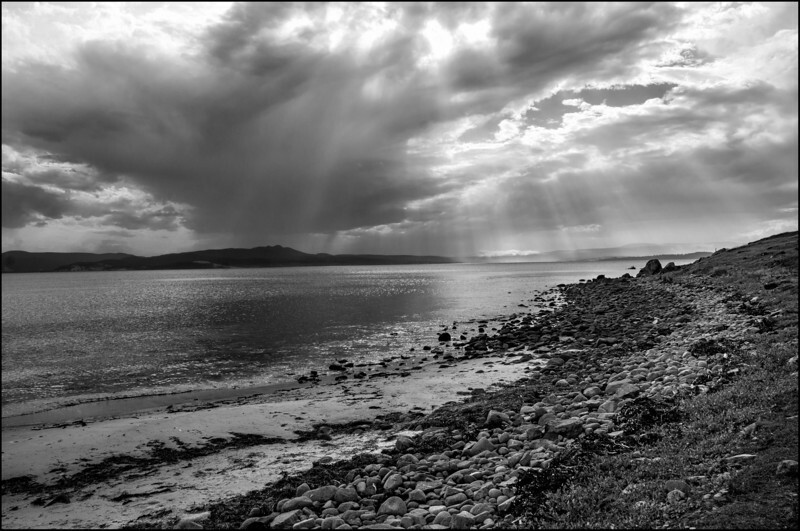 Bear this in mind if you’re a day tripper to the island, as the gap between the earliest and latest ferries is only around 6.5hrs in summer (even less in winter)! You wouldn’t want to get stranded. In reality we probably did take an extra 30-60mins in negotiating the scree compared to some bushwalkers, but all the same, it’s a hike that is going to take some time! Another thing to keep in mind when preparing for this hike is the weather. We had absolutely perfect conditions, yet from numerous reports it sounds like that is a rarity and that you should be prepared for mist/cloud at the summit. 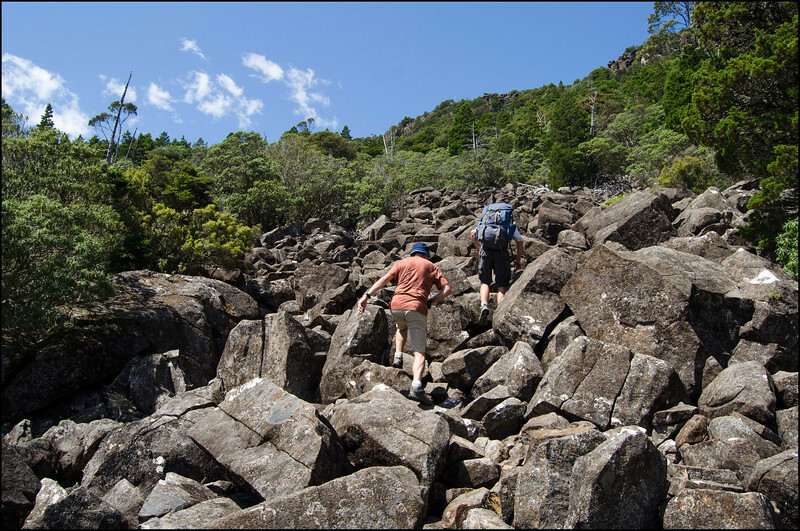 As with any Tasmanian bushwalk, the conditions can change rapidly and temperatures can plummet within a matter of minutes, so keep an eye on the forecast and always take some warm clothing and a waterproof jacket just in case. Personally, if you’re a day tripper or if it’s your first time staying overnight on the island then I would recommend focusing on Bishop and Clerk first up, with Mt Maria as an option for another day or another visit. In my opinion the reward to effort ratio is just that little bit higher for Bishop and Clerk. Another map that may assist in planning and undertaking this walk is the one produced by the Parks and Wildlife Service. You can find that map here. Loved the write up, am planning a visit so was pleased with a down-to-earth report of the trip to the top of Mt Maria. 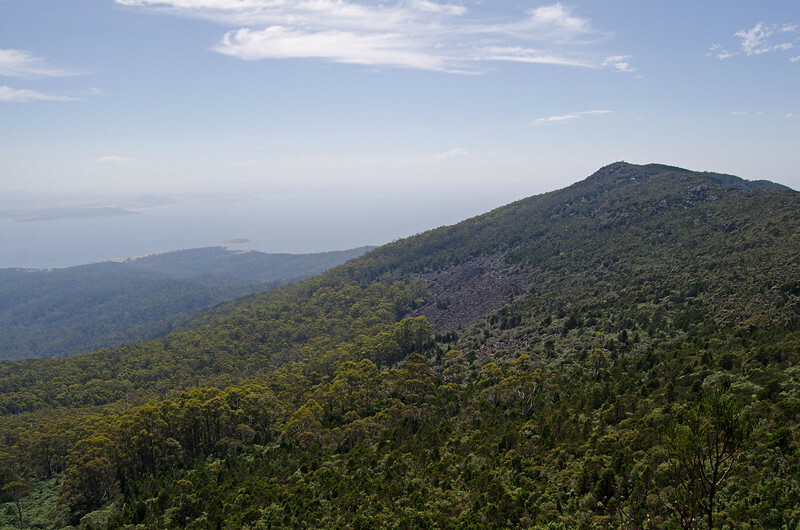 I recommended you visit Flinders Island and do Mt Strezlecki – its awesome ! The whole island is unreal. 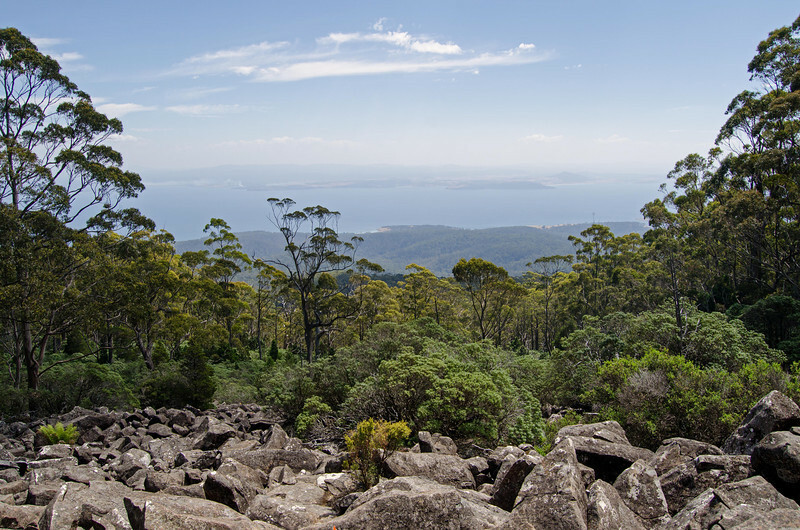 Thanks Hugo, it’s one of our favourite places in Tasmania to ‘get away from it all’.